The Diocese of Cape Town has just concluded their Diocesan Synod. During the process they used enough paper to cut down three and a half trees. Gabriella Jacobs put forward a motion that the Synod should move to being primarily paperless by 2020 and totally paperless by 2023. Although she recognized that this might be hard for the older generation , the youth are used to electronic devices and can help with the process as many people in the room could be seen to be using smart phones, tablets or laptops. Music can be displayed on the screen and paper where it has to be used can be double sided and save as much as possible. An motion on Water justice was also passed by Rev Shaun Cozett and Rev Rachel Mash which called on the Church to study water in scripture during Lent 2018, celebrate World Water Day close to March 22nd and to hold a Diocesan Conference on water during 2018. In her presentation Rev Mash highlighted that even with normal rains up until the end of September we will be left with 200 days of rain. Day Zero for running out of water is March 2nd. At that time very expensive measures such as desalination, boring of the aquifers and treatment of waste water will have to kick in. 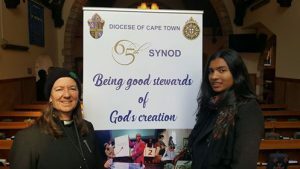 The Diocese of Cape Town is also celebrating 25 years of the ordination of women.